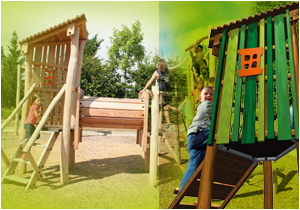 Playhouses and balancing trails combine to create structures that cover all the basic play functions, whilst also blending in perfectly with the surrounding environment. There are limitless combinations. Triangular towers with different platform heights, ladders, climbing ramps, fixed and mobile bridges, tunnels, vertical nets, climbing walls, slides and fireman’s poles.